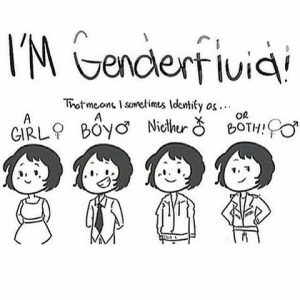 “Gender-Fluid” — A Quart Low in the Head! A number of years ago the late American writer and humorist, Lewis Grizzard wrote a book titled, If Love Was Oil, I’d Be a Quart Low. Those who are pushing the radical, relativistic, agenda of human sexuality and love, especially as it relates to gender identity and gender fluidity, are more than a quart low in the head! Our modern day “trans” and “gender fluid” revolution, as it has been called by its devotees, has transferred us into a bizarre, baffling, batty new world. We now have transgenderism (identifying as a gender contrary to one’s body), a transman and transwoman (a man who was assigned female at birth or a female who was assigned male at birth. Trans men can identify as any sexuality, such as homosexual, gay, pansexual, polysexual, asexual, demisexual, etc. The “trans” identity issue has spilled over into other identity issues such as transracialism (identifying as a race contrary to one’s ethnicity), and transableism (identifying as disabled contrary to one’s ability), and transspeciesism (identifying as a species contrary to one’s DNA). For the last century, the Boy Scouts of America has determined eligibility for its programs based on an applicant’s birth certificate. Needless to say, it only admitted biological males. But no longer. “Trans-boys” (that is, biological females who identify as boys) can now join the BSA. The UK Guardian newspaper after publishing an article titled, “The gender-fluid generation: young people on being male, female or non-binary,” asked young people around the world to tell them how they define their gender. They received 104 responses from people who felt gender fluid to a greater or lesser extent. For some this even meant fluctuating between a multitude of genders. Clo, 23, from the US – who identifies as transmasculine, gender fluid, non-binary, and queer trans – says their family cannot accept them for who they are. “People think, just because the words to describe us are new, that being non-binary is a fad. But people have always lived and felt non-binary – there’s just a label for it now. We must compassionately and truthfully navigate a path between the folly of affirming transgenderism and the cruelty of dismissing the distress of those who experience gender incongruence. What made the difference? The loving and presupposition-challenging ministry of then — pastor of the Syracuse Reformed Presbyterian Church, Ken Smith and his wife. For over a period of two years they gently confronted Rosaria with the truth of the claims of Jesus Christ upon her life. And God’s kind of true love won out! “We cannot be silent, and we cannot join the moral revolution that stands in direct opposition to what we believe the Creator has designed, given, and intended for us. Next articleWhat Do Heroes Look Like?